It’s called by different names in different regions. You may know it as a sidewalk strip, median, tree lawn, parking strip, boulevard or hell strip. It’s that no man’s land between street and sidewalk, where grass struggles to grow and dogs frequently do their business. Technically part of the city’s right-of-way, this hot, neglected area is one of the most visible parts of your property. Learn techniques to transform your yard’s hell strip into an eye-pleasing scene. The sidewalk strip offers several gardening challenges. Heat. Temperatures soar in this area due to reflected pavement heat, often reaching 150 degrees at soil level. Salt. In areas where winter brings freezing temperatures, road salt saturates soil and pickles plants. Feet. No one can resist a shortcut, and this area is frequently trampled by passersby, paws and bike-riding children. Drought. Because the sidewalk is higher than the street, soil typically slopes, shuttling water onto the street. The average homeowner wastes gallons of water trying to irrigate this small patch of lawn. Compaction. When crews built the road, they compacted this soil severely, making it tough for plant roots to penetrate. Snow. In colder regions, roadside snow piles occupy this area, crushing plants that do manage to gain a foothold. To grow and plant anything successfully in the sidewalk strip, you must address two primary concerns: soil and plant selection. Knowing that soil in the sidewalk strip is compacted, salty, drought-prone and hot, start landscaping by focusing on improving soil to make your plant care routine easier and more sustainable. Remove sod in small chunks, flip it upside down and chop it into existing soil. Allow grass to compost for 6–8 weeks before planting. With warm-season grasses like Bermuda or to plant immediately, kill grass using a weed killer that won’t linger in the soil. Wait the required time as indicated on the label before planting. Digging 1–2 inches of compost into existing soil improves most soil types. Mediterranean or prairie plants that like lean soil don’t need compost. To improve soil for these types of plants, consider digging into existing soil 1 inch of quarter-10 gravel (crushed quarter-inch gravel passed through a No. 10 sieve). Use caution adding gravel to clay soils. This can create an almost cement-like blend. Select plants with a pedigree that includes modifiers like carefree, drought-tolerant and tough. If your winter conditions tend to fill the sidewalk strip with large snow piles, plant perennials, which won’t be damaged by snow. 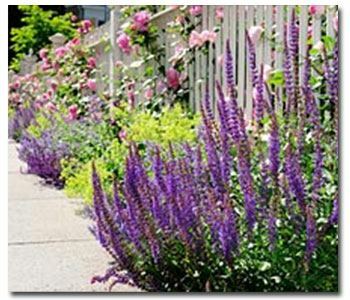 Native plants typically stand up to sidewalk strip rigors and will be easier to care for. If you want turf, use buffalo grass or sheep fescue. Learn more about hearty plants perfect for the sidewalk strip. There might be rules. Check with your city road or transportation department to learn guidelines for sidewalk strip plantings. Most regulations relate to safety and visibility and may specify things like plant height, setback for planting beds (from the street or trees), or planting bed dimensions. You need a path. Provide a footpath from sidewalk to street. Streetside, consider landscaping a landing pad, a place folks can stand when they exit a car. Irrigation may be necessary. Even for drought-tolerant native plants, watering is vital during the first growing season – and sometimes when extended dry spells combine with high temperatures. Make sure you can water the sidewalk planting area. Add mulch to conserve soil moisture. Avoid using wood chips, which could wash into the street (and sewers) in heavy rain. Pea gravel, chopped leaves, pine straw or compost are options for effective mulch. Dig a ditch. Create a small basin around the planting area to prevent soil or water from spilling into the street.